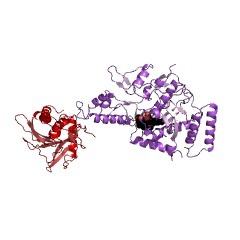 Chloramphenicol acetyltransferase (CAT) (PUBMED:1867713) catalyzes the acetyl-CoA dependent acetylation of chloramphenicol (Cm), an antibiotic which inhibits prokaryotic peptidyltransferase activity. Acetylation of Cm by CAT inactivates the antibiotic. A histidine residue, located in the C-terminal section of the enzyme, plays a central role in its catalytic mechanism. There is a second family of CAT (PUBMED:1314803), evolutionary unrelated to the main family described above. These CAT belong to the bacterial hexapeptide-repeat containing-transferases family (see ). 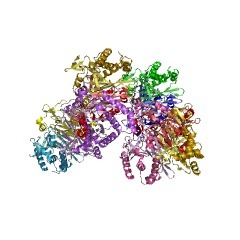 The crystal structure of the type III enzyme from Escherichia coli with chloramphenicol bound has been determined. 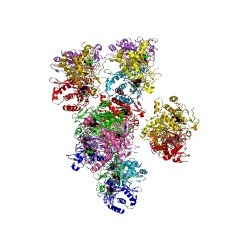 CAT is a trimer of identical subunits (monomer Mr 25,000) and the trimeric structure is stabilised by a number of hydrogen bonds, some of which result in the extension of a beta-sheet across the subunit interface. Chloramphenicol binds in a deep pocket located at the boundary between adjacent subunits of the trimer, such that the majority of residues forming the binding pocket belong to one subunit while the catalytically essential histidine belongs to the adjacent subunit. His195 is appropriately positioned to act as a general base catalyst in the reaction, and the required tautomeric stabilisation is provided by an unusual interaction with a main-chain carbonyl oxygen (PUBMED:2187098). 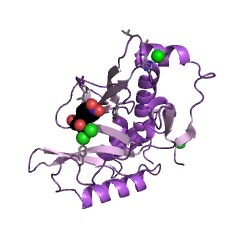 Chloramphenicol acetyltransferase (CAT) (EC 2.3.1.28) [(PUBMED:1867713)] catalyzes the acetyl-CoA dependent acetylation of chloramphenicol (Cm), an antibiotic which inhibits prokaryotic peptidyltransferase activity. Acetylation of Cm by CAT inactivates the antibiotic. 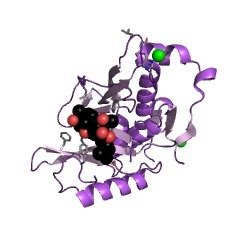 A histidine residue, located in the C-terminal section of the enzyme, plays a central role in its catalytic mechanism. 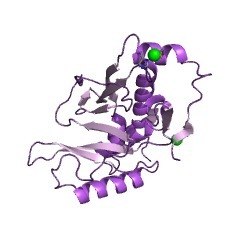 The crystal structure of the type III enzyme from Escherichia coli with chloramphenicol bound has been determined. 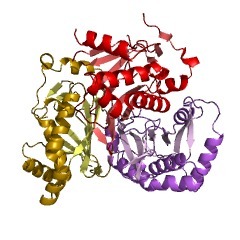 CAT is a trimer of identical subunits (monomer Mr 25,000) and the trimeric structure is stabilised by a number of hydrogen bonds, some of which result in the extension of a beta-sheet across the subunit interface. Chloramphenicol binds in a deep pocket located at the boundary between adjacent subunits of the trimer, such that the majority of residues forming the binding pocket belong to one subunit while the catalytically essential histidine belongs to the adjacent subunit. His195 is appropriately positioned to act as a general base catalyst in the reaction, and the required tautomeric stabilisation is provided by an unusual interaction with a main-chain carbonyl oxygen [(PUBMED:2187098)]. There are 3170 CAT domains in 3170 proteins in SMART's nrdb database. Taxonomic distribution of proteins containing CAT domain. This tree includes only several representative species. The complete taxonomic breakdown of all proteins with CAT domain is also avaliable. Click on the protein counts, or double click on taxonomic names to display all proteins containing CAT domain in the selected taxonomic class. The chloramphenicol acetyltransferase gene of Tn2424: a new breed of cat. We have sequenced the gene coding for the chloramphenicolacetyltransferase of Tn2424 of plasmid NR79. This gene codes for a proteinof 23,500 Da, and the derived protein sequence is similar to those of thechromosomal chloramphenicol acetyltransferases of Agrobacteriumtumefaciens and Pseudomonas aeruginosa and of unidentified open readingframes, which may encode chloramphenicol acetyltransferases, adjacent tothe ermG macrolide-lincosamide-streptogramin resistance gene of Bacillussphaericus and the vgb virginiamycin resistance gene of Staphylococcusaureus. Weaker similarity to the LacA (thiogalactoside acetyltransferase)and CysE (serine acetyltransferase) proteins of Escherichia coli and theNodL protein of Rhizobium leguminosarum is also observed. There is nosignificant similarity to any other chloramphenicol acetyltransferasegenes, such as that of Tn9. 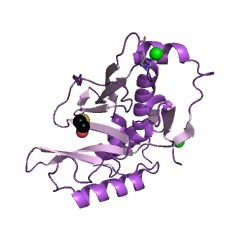 The Tn2424 cat gene is part of a 4.5-kb regionwhich also contains the aacA1a aminoglycoside-6'-N-acetyltransferase gene;Tn2424 is similar to Tn21 except for the presence of this region.Sequences flanking the cat gene are typical of those flanking other genesinserted into pVS1-derived "integrons" by a site-specific recombinationalmechanism. The zipper-like folding of collagen triple helices and the effects ofmutations that disrupt the zipper. 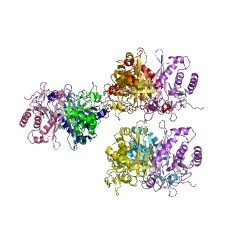 Refined crystal structure of type III chloramphenicol acetyltransferase at1.75 A resolution. High level bacterial resistance to chloramphenicol is generally due toO-acetylation of the antibiotic in a reaction catalysed by chloramphenicolacetyltransferase (CAT, EC 2.3.1.28) in which acetyl-coenzyme A is theacyl donor. The crystal structure of the type III enzyme from Escherichiacoli with chloramphenicol bound has been determined and refined at 1.75 Aresolution, using a restrained parameter reciprocal space least squaresprocedure. The refined model, which includes chloramphenicol, 204 solventmolecules and two cobalt ions has a crystallographic R-factor of 18.3% for27,300 reflections between 6 and 1.75 A resolution. The root-mean-squaredeviation in bond lengths from ideal values is 0.02 A. The cobalt ionsplay a crucial role in stabilizing the packing of the molecule in thecrystal lattice. CAT is a trimer of identical subunits (monomer Mr 25,000)and the trimeric structure is stabilized by a number of hydrogen bonds,some of which result in the extension of a beta-sheet across the subunitinterface. Chloramphenicol binds in a deep pocket located at the boundarybetween adjacent subunits of the trimer, such that the majority ofresidues forming the binding pocket belong to one subunit while thecatalytically essential histidine belongs to the adjacent subunit. His195is appropriately positioned to act as a general base catalyst in thereaction, and the required tautomeric stabilization is provided by anunusual interaction with a main-chain carbonyl oxygen.